Superian signals to the giant AVM, a man named Clifford Richter, informing him he is too big. He then scolds the general that's leading the defensive strategy against Clifford, saying Clifford is still a civilian under his protection. Superian is also shown to be suffering from headaches, something atypical to his super state of being. Overkill prepares to interrogate Ramses to get the answers they're after. Tick and Arthur don't want Overkill to kill him but Overkill actually interrogates him with a serum that's supposed to cause him to reveal the truth but he begins to act strangely after injected, due to his being on other medication. Arthur insists on bringing Ramses to AEGIS, the organisation in charge of all things superhero-related, but they find that the office is killed. Without any superheroes in town following the reign of Terror, there was no longer any need for them to maintain an office. Lint is still dealing with the shock of Terror still being alive, having pulled out his own teeth as part of the elaborate plan to fake his death and most importantly, fool Superian. Lint needed to be mourning him to make it truly believable. Terror says he has been watching Lint, but the conversation is briefly interrupted by Derek, whom he knocks out with some platypus venom. He is surprised that Lint married Derek, as he had been the one to set up the wifi for his lair many years ago. The two sit down for a meal and Terror reveals that he only originally intended for her to think he was dead for a little while. Based on her character, he had presumed that after a bit of time, she would kill Ramses and take control of the operation. Once she had done that, he would have revealed himself to her. Arthur and Tick are interrupted by the arrive of Ramses' men, who spotted him out and about and called in backup. They shoot Tick with a large weapon that doesn't harm him but does give the necessary opportunity for Ramses to get away and return to his men. Ramses uses the weapon to shoot at a bus of civilians instead, knowing that Tick and Arthur will focus on helping them over trying to stop Ramses from getting away. The bus is perched on the edge of a large overpass so Tick holds onto it to try to keep it from falling while Arthur begins helping people get out of the bus. Tick prepares to let the bus drop, believing that everyone is off and beginning to struggle to keep the bus from falling, but a woman cries out that her baby is still on board. Arthur actives his suit and runs back into the bus finding the baby carrier. Tick is no longer able to keep the bus from falling and is momentarily distraught that Arthur has been harmed but Arthur instead flies up, safe, still holding the baby carrier. The baby turns out to be a dog, but the crowd of people watching are all filming the incident with their phones and cheer for Tick and Arthur's heroism. The other characters of the show are shown to be watching the news and learning of what has transpired, while Lint arrives at Ramses' lair and kills him. Tick and Arthur are greeted by all the different people in the city who congraulate them for their good deed. Dot is still helping to patch up injured criminals, prioritising her medical oath. Tick and Arthur return to the local corner shop but Arthur goes back outside to take a call from Overkill, who scolds him for putting himself out in the public eye since doing so will put him at risk. Overkill also reveals that the true translation of the video files on the suit's system is that it's part of a larger weapons system designed to kill Superian. That is the true target of Terror's evil plot. Arthur cries out that they need to warn Superian but he's kidnapped by some anonymous threat. Tick runs outside and finds Arthur missing, with only the glove of his suit left behind. Arthur is shown to be captive and tied to a chair, no longer in the suit. When the bag is removed from his head, Terror reveals himself to Arthur who screams in response. 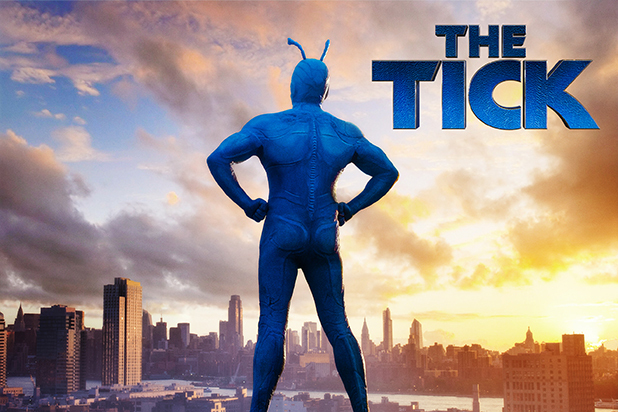 The Tick is available for streaming on Amazon Prime.